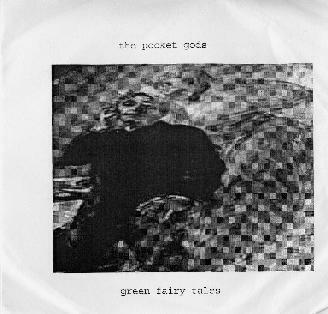 The Pocket Gods - "Green Fairy Tales"
This UK artist (Mark Lee) has created an interesting lo-fi collection of singer songwriter songs about strange things, going to the bar, and lots of booze, particularly, Absinthe. The CD opens with "Weekend Revulers", which will remind you of the Beatles. "Verlaine Corner" reminds me a bit of the early Bevis Frond material with a more psychedelic flavor to it. "Green Fairy" is a very bluesy based song with a drunken feeling. "With the Flowers and With Women" has a French woman talking and is a strange organ based thing you might hear on the street in Paris. "Absinthe Frappe" and "You Are My Frankenstein" reminds me of the late 60's slow stoned blues. "Godless in my Wormwood" is a more upbeat rock song with some cool effected guitar and a strange keyboard line. Tracks like "Talking to Lamposts" beg for them to be extended into some sort of cool psych jam.. Not here.. All songs on this CD are between the 1-4 minute range with only "The Decadents" extended into nearly 9 minutes. "Drunk Again in Nub Country" is a piano based drunken blues. Funny lyrics. "Jug" is a 30 second rant about children of the revolution before going into the fast paced "Fonder About Absinthe". "L-Absinthe" has a French speaking woman speaking about Absinthe and some nice psychy guitar to start the track but this fades into some noise as a cool bass line builds it up again and this is repeated. "Decadents", the only extended track, is also a psychy number with cool guitar (acoustic and electric layered) and a rant by Mark. The CD ends with "Underworld". Pretty cool and interesting psych-folk-blues material. I enjoyed this CD a lot. For more information you can visit The Pocket Gods web site at: http://www.thepocketgods.com.